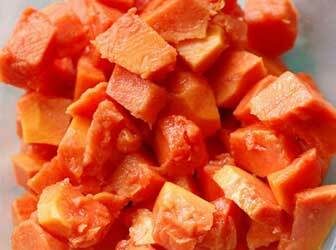 1 cup of diced fresh papaya (small cubes make for a more blended flavor, larger cubes more contrast). 1 cup of diced fresh pineapple (don’t use canned, it’s too sweet). 1 medium-sized red onion finely chopped. 1 medium red bell pepper finely chopped. A handful of chopped parsley or cilantro. The juice of a whole lime. A drizzling of avocado oil, olive oil or, for an interesting extra layer of flavor, pumpkin seed oil. Himalayan crystal salt and chili powder to taste. Mix and toss together the papaya, pineapple, onion, bell pepper and parsley or cilantro with two spoons. Pour over the lime juice, covering as much as possible and toss. Drizzle in the oil and toss again. Finish with a little salt and chili powder if you enjoy it and serve, either directly onto the meat or as a delicious side serving. There is an unusual combination of sweet and savory flavors in this ripe papaya salad. Use it as a side serve to your meals or add organic chicken, wild salmon or grilled portobello mushrooms to the mix for an great tasting lunch or dinner on its own. A large bowl of mixed salad leaves (nutritious rocket goes particularly well). 1 cup of ripe papaya cubed. 1 cup of avocado cubed. 1 medium-sized tomato roughly chopped. Half a medium-sized red onion finely chopped. 1 to 2 cloves of crushed garlic to taste. 1 tablespoon of avocado oil or extra virgin olive oil. 1 tablespoon of pumpkin seed oil or balsamic vinegar. Himalayan crystal salt and cracked black pepper to taste. Carefully toss the papaya, avocado, tomato and red onion with the salad leaves until mixed. Pour the lemon juice, avocado oil (or olive oil), pumpkin seed oil (or balsamic vinegar) and crushed garlic into a bowl and whisk with a fork until blended together. Drizzle this over the salad and gently toss again. Season with a little crystal salt and pepper and serve. I hope you enjoy these two papaya recipes as much as I do. The rich sweetness of the papaw adds a fresh and unusual flavor to meals while improving your digestion. There are many interesting papaya fruit health benefits and this is a great tasting way to add much more papaya to your diet. Next is a look at something completely different – Papaya Facial Treatments for Better Skin. I lost a favorite recipe for a raw “Sauce” (or dressing ?) to put on top of peeled and cut ripe cubes of Papaya, that included a few of the seeds, and it was all put into a Blender.